On top of that, our Greek Salad will pack a flavorful punch with its similar notes of Feta, Cucumber, Tomatoes and Red Wine Vinaigrette, with the addition of earthy Kalamata Olives for an extra memorable layer of zest. For those willing to indulge a little, we recommend our Featured Shake: Rocky Road! As usual, our shakes are always make with locally churned Dave’s Hawaiian Ice Cream for an undeniable depth and creaminess that can’t be beat. As the days grow warmer, this shake is the one to try! Our newest restaurant in Hale‘iwa Town is now open and in full swing, welcoming locals and visitors to our very first tiki bar-themed Teddy’s! We developed a full beverage menu with specialty cocktails and also are serving exclusive burgers in honor of the beautiful town of Hale‘iwa in the North Shore of O‘ahu. Please come on by and experience Teddy’s with us. No matter which location or franchise around the globe, every customer who visits Teddy’s can expect the best of the best, both in service and in food. That’s our commitment to you. Looking for a job or career? All Teddy’s locations are currently accepting new hires, so feel free to stop by your neighborhood Teddy’s and apply to become a part of our family. For franchise opportunities, offers are by prospectus, so please visit our website for more information at http://www.teddysbiggerburgers.com/. Follow our burgers and shakes online! Love us? Visit us on Yelp! 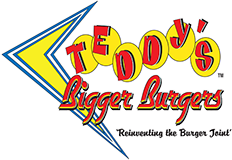 Like us on Facebook, follow us on Twitter at @TeddysBiggerBugers. We’re also on Instagram, follow us at @TeddysBugers. Don’t forget to hashtag your posts using #teddysbiggerburgers.